The accuracy of U.S. stock return forecasts based on the cyclically-adjusted P/E (CAPE) ratio has deteriorated since 1985. The issue is not the CAPE ratio, but CAPE regressions that assume it reverts mechanically to its long-run average. Our approach conditions mean reversion in the CAPE ratio on real (not nominal) bond yields, reducing out-of-sample forecast errors by as much as 50%. At present, low real bond yields imply low real earnings yields and an above-average “fair-value” CAPE ratio. 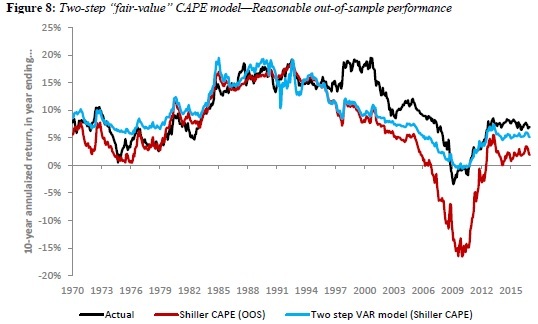 Nevertheless, with Shiller’s CAPE ratio now well above its fair value, our model predicts muted U.S. stock returns over the next decade. We believe that our framework should be adopted by the investment profession when forecasting stock returns for strategic asset allocation. "Valuation metrics such as price-earnings ratios are widely followed by the investment community because they are believed to predict future long-term stock returns. Arguably the most popular is Robert Shiller’s cyclically-adjusted P/E ratio (or CAPE) which is currently above its long-run average. However, the out-of-sample forecast accuracy of stock forecasts produced by CAPE ratios has become increasingly poor. In this paper we have shown why and offer a solution to offer a more robust approach to produce long-run stock return forecasts. The problem is not with the CAPE ratio, but with CAPE regressions. We show that a common industry approach of forecasting long-run stock returns can produce large errors in forecasted returns due to both estimation bias and its strict assumption that the CAPE ratio will revert over time to its long-run (and constant) mean. Although far from perfect, our model’s out-of-sample forecasts for ten-year-ahead U.S. stock returns since 1960 are roughly 40-50% more accurate than conventional methods. Real-time forecast differences in 10-year-ahead stock returns are statistically significant, and have grown to exceed three percentage points after 1985 given the secular decline in real bond yields. In our model, lower real bond yields imply higher equilibrium CAPE ratios. This framework would appear to explain both elevated CAPE ratios and robust stock returns over the past two decades. Figure 8 shows the actual real-time forecast of our two-step model for U.S. stocks. Our fair-value CAPE approach tracks the actual rolling 10-year-ahead U.S. stock returns fairly well, declining throughout the 2000s and anticipating a strong rebound immediately following the global financial crisis in 2009. Traditional CAPE regressions are also highly correlated with future returns, yet they consistently project lower 10-year-ahead stock returns than what has been actually realized by investors over our sample period. As of June 2017, our model projects a guarded, lower-than-historical return on U.S. stocks of approximately 4.9% over the coming decade." We study the performance of a comprehensive set of equity premium forecasting strategies that have been shown to outperform the historical mean out-of-sample when tested in isolation. Using a multiple testing framework, we find that previous evidence on out-of-sample predictability is primarily due to data snooping. We are not able to identify any forecasting strategy that produces robust and statistically significant economic gains after controlling for data snooping biases and transaction costs. By focusing on the application of equity premium prediction, our findings support Harvey’s (2017) more general concern that many of the published results in financial economics will fail to hold up. One challenge in answering the question of out-of-sample predictability is that almost all forecasting strategies are tested on a single data set. When many models are evaluated individually, some are bound to show superior performance by chance alone, even though they are not. This bias in statistical inference is usually referred to as ‘data snooping’. Without properly adjusting for this bias in a multiple testing set-up, we might commit a type I error, i.e., falsely assessing a forecasting strategy as being superior when it is not. In fact, Harvey, Liu, and Zhu (2016) note that equity premium prediction offers an ideal setting to employ multiple testing methods. To the best of our knowledge, our study is the first to jointly examine the out-of-sample performance of a comprehensive set of equity premium forecasting strategies relative to the historical mean, while accounting for the data snooping bias. We construct a comprehensive set of 100 forecasting strategies that are based on both univariate predictive regressions and advanced forecasting models, including strategies that adopt diffusion indices or combination forecast approaches, apply economic restrictions on the forecasts, predict disaggregated stock market returns, or model economic regime shifts. We use these forecasting strategies to predict the monthly U.S. equity premium out-of-sample based on the most recent 180 months and track their out-of-sample perfor-mance for the subsequent month over the evaluation period from January 1966 to December 2015. We aim to answer Spiegel’s (2008) question, i.e., whether there are forecasting strategies that provide a significantly higher performance than the prevailing mean model. As performance measures, we use the mean squared forecast error and absolute as well as risk-adjusted excess returns. Why is data snooping a concern in our analysis? Suppose these 100 models are mutually independent, and we apply a t-test to each model with the significance level of 5%. The probability of falsely rejecting at least one correct null hypothesis is 1 – (1 – 5%)100 ≈ 0.994. Therefore, it is very likely that an individual test may incorrectly suggest an inferior model to be a significant one. This simple example emphasizes the importance of an appropriate method that can control such data-snooping bias and avoids spurious inference when many models are examined together. Our results show that many forecasting strategies outperform the historical mean when tested individually. However, once we control for data snooping, we find that no forecasting strategy can outperform the historical mean in terms of mean squared forecast errors. With respect to return-based performance measures, we find marginal evidence for statistically significant economic gains at least on a risk-adjusted excess return basis when using the equity premium forecasts in a traditional mean-variance asset allocation, even after controlling for data snooping bias. In contrast, the benefits for a pure market timing investor are limited. Taken together, our findings strengthen the results of Goyal and Welch (2008) that the out-of-sample predictability of the equity premium is questionable." We at Quantpedia are pleased to invite you to a our new webinar Classification of Quantitative Trading Strategies prepared in cooperation with our friends from QuantInsti. Webinar is scheduled on Tuesday 11th July, 9:30 AM EST | 7:00 PM IST | 9:30 PM SGT and will cover a range of topics related to applicability of financial academic research in a real trading. Title: Are REITs a Distinct Asset Class? Real estate investment trusts (REITs) are often considered to be a distinct asset class. But, do REITs deserve this designation? While exact definitions for asset class may vary, a number of statistical methods can provide strong evidence either for or against the suitability of the designation. The authors step back from the established real estate and REITs literature and answer this broader question. Beginning with a set of asset class criteria, the authors then utilize a variety of statistical methods from the literature and factor-based asset pricing to evaluate REITs for their candidacy as a distinct asset class. REITs fail to satisfy almost all of the relevant criteria which leads the authors to conclude that REITs, in fact, are not a distinct asset class but do deserve a market capitalization weighted allocation in a diversified investment portfolio. ficant excess return relative to what is explained by a generally accepted factor model like the Carhart  four-factor model. For example, early research on the size and value premiums argued that these two types of equity securities are distinct equity asset classes because their excess returns are not fully accounted for by CAPM. ts and suggesting sizable portfolio allocations. fication properties of REITs on a statistically inferred basis. These tests suggest that REITs do not reliably improve the mean-variance frontier when added to a benchmark portfolio of traditional stocks and bonds. These results, and the associated failure to satisfy our asset class criteria, lead us to conclude that REITs are not a distinct asset class. Factor investing has experienced a resurgence in popularity under the moniker “smart beta.” Several traditional factors, such as value, size, momentum, and low beta, are well defined and have been heavily researched in academia as return anomalies for many decades. These factors have also been exploited by practitioners as quantitative strategies for enhancing returns. Today, these factors each define a distinct smart beta category (think of style boxes for smart beta strategies) and are the foundational building blocks for the now-ubiquitous multi-factor products. "The recently popularized quality factor, however, appears to stand-alone in many regards. Like the four previously named factors (value, size, momentum, and low beta), quality investing has been widely practiced as an investment strategy by portfolio managers. MSCI, FTSE Russell, S&P, EDHEC, and Deutsche Bank, among others, have created quality factor indices for licensing and have generally included quality as a part of their multi-factor offerings. But, unlike the conventional factors, quality as a source of return has attracted limited academic attention and has been focused on only some facets of what practitioners categorize as quality. In a way, quality is a product waiting for academic validation, and the early results appear to be more inconclusive than its massive popularity might warrant. In a routine product conversation with investors, the quality factor is pitched by providers as an independent source of return and as providing diversification due to its supposedly low correlation with the value factor. What remains uncomfortable for researchers, however, is that the quality factor is constructed very differently than other factors. Factors, such as value or low beta, are created from a particular stock characteristic (or a set of highly related stock characteristics) to capture a risk premium associated with an undiversifiable economic risk or to capture an anomalous return associated with a persistent investor behavioral bias. For example, the value factor is generally constructed from stocks that have high book-to-price, high earnings-to-price, high dividend-to-price, or some combination of these valuation measures. Regardless of the chosen definition for factor construction, the resulting portfolio looks and feels like a value portfolio in that it owns low valuation stocks. In contrast, quality factor portfolios, as constructed by the different providers, have been entirely multi-signal in nature. Providers tag a stock as high quality if it scores high on some combination of the following attributes: earnings growth, earnings-growth stability, low return-volatility, high profitability, high return on assets (ROA), low debt ratio, and low accounting accruals. We begin our study by examining definitions of quality implemented in different product offerings. We show that quality, as executed by practitioners, is a collection of heterogeneous signals having little correlation with each other. Quality, as currently defined, would seem to be a catch-all bucket for those portfolios that blend many otherwise independent return factors. These stock screens appear to favor heterogeneous groups of stocks and produce portfolios with low correlation to one another. The stocks appear to be selected for their diversity, and the multiple signals used in constructing the quality portfolios do not appear to be proxies for a single specific risk exposure or behavioral anomaly. Thus, a quality portfolio can seem more like a quantitative strategy based on multiple signals than a factor in the heritage of the arbitrage pricing theory (APT) framework. This unique feature plays an important role in how we analyze quality products versus how we examine other more conventional factors. Because quality is being defined as it is—a collection of heterogeneous signals—a spectrum of possible portfolio outcomes exists. In the most positive case, the resulting quality portfolio has impressive out-of-sample performance if each of the signals or characteristics included in the construction of the portfolio represents a unique source of premium, whether risk based or behavioral based. In this case the resulting quality portfolio would be a multi-factor portfolio offering a diversified basket of excess returns. In the worst case, the multi-signal portfolio will have indistinguishable from zero out-of-sample performance despite its impressive back-tested t-stats. Why could t-stats be misleading in this case? The large pool of multiple signals to select from creates opportunities for intentional or unintentional data mining overstating the t-stats; this issue has been emphasized by Harvey, Liu, and Zhu (2015). Further, from Novy-Marx (2016) we know that combining several uncorrelated factors selected because of their spurious in-sample performance further overstates the t-stat. For example, if an ex ante random strategy has an in-sample t-stat larger than 2 with only a meager 5% probability, then a mix of three such strategies selected ex post for best performance out of 20 strategy realizations will register a t-stat above 2 with a probability of nearly 98%. In reality, this portfolio will offer investors nothing more than noise and unwarranted fees and expenses, suggesting that the process of analyzing and contrasting different quality portfolio methods is both more difficult and more important. Given the observation that quality is a collection of heterogeneous signals, we examine where the current quality portfolios are on the spectrum of robustness: from being a collection of robust anomalies with a high chance of outperformance, at one end, to being a collection of signals selected due to their spurious in-sample performance with little chance of outperformance out of sample, at the other end. We use the Hsu, Kalesnik, and Viswanathan (2015) method to identify robustness of variables used in quality definitions."